Knowledge is one of the most important competitive resources a business can have. 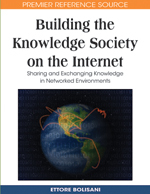 However, the failure of knowledge management initiatives in the last decade, especially the failure of knowledge management (sharing) systems, directly points out the inadequacy of current approaches to knowledge sharing.This chapter, expanding on the current view of knowledge and knowledge management, offers an alternative approach to knowledge sharing. It is argued that to understand employee knowledge-sharing behavior, we have to understand the interactions between organizational context and individuals’ sense-making processes before achieving success. Studies in knowledge sharing are reviewed before the missing organizational factors are pointed out. Established theories in sociology, management science, and organizational behavior are introduced where the influences of both formal and informal organizational factors on employee knowledge sharing are elaborated. Theoretical and practical implications of current study on knowledge-sharing research are discussed in the end.